Crail is a historic fishing village in the pretty East Neuk of Fife. Explore the narrow wynds of the village or simply take a walk along the quaint harbour to see the fishing boats. Charming cobbled streets tumble down to the miniature harbour, which is sheltered by cliffs and surrounded by historic fishing cottages. 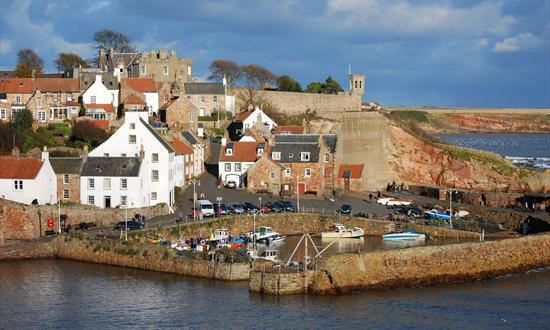 Crail is a historic fishing village on the East Neuk of Fife coast and is well worth a visit. Only 90 minutes by car from Edinburgh and 10 miles south of St Andrews, the Home of Golf. Drive along the picturesque Fife Coastal Route, an 85 mile drive around the beautiful north east coast of the Kingdom of Fife. Alternatively explore by foot and take to the The Fife Coastal Path which runs from the Forth Estuary in the south, to the Tay Estuary in the north and stretches for 117 miles. This waymarked path can be explored in small sections and passes by Crail and other fishing villages including Elie and St Monans. Visitors flock to the harbour front for an ice cream and a stroll to see the fishing boats or to simply explore the timeless wynds within the village. In the summer, the Crail Food Festival is a treat for the senses. There is plenty to explore while you are here including a heritage centre, galleries, local shops as well as local eateries such as delightful tearooms. Local amenities such as a bank and convenience store are also available.